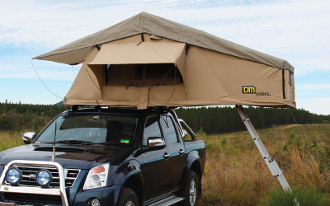 The Yulara Roof Top Tent is always there where you are. And it's ready for a comfy night's sleep in just minutes. You’ll be nestled snugly on the 65mm built in high density foam mattress with a great view of the surroundings. Your roof top accommodation will not only get you off the ground, it will also get you away from those annoying leaves, sticks, sand and nocturnal creepy crawlies that can ruin a good night’s repose. There’s a built in sturdy aluminium ladder that takes you to ground level in a jiffy, where you can relax over a snack and cup of coffee in the shade of an optional TJM Awning. TJM Yulara tent is so simple, the Yulara can literally be set up within minutes. Enjoy a hassle-free night's sleep In a TJM Yulara tent!